COLUMBIA, NOV. 11, 2008 (Beat Byte) -- The Columbia City Council has voted to question Boone County assessor Tom Schauwecker about large property tax breaks his office provides developers that appear unjustified at best; egregious at worst. The breaks appear to violate or misread a state statute designed to help working farmers. "Current property tax assessments may be severely underestimating the property values that subsidize our city, county, and school district budgets," said Columbia City Council member Karl Skala. "These extremely developer-friendly tax assessment policies are now facing mounting public scrutiny in the face of shrinking local budgets." Under Missouri law (RSMo 137-016 and 137.119), WORKING farmland is taxed at a rate far lower than either commercial or residential land, even if it's been platted for development. But the key word is "working." To qualify for the tax breaks, the law is clear: the land must be ACTIVELY FARMED, not simply zoned "agricultural" or dotted with rusty hay balers. The idea behind the law is simple: that family farmers who continue to work their land, even if they plan to develop it, can continue to receive what is essentially a farm subsidy. Stop farming, however, and the tax break stops too. Around Boone County, what is a subsidy for farmers has become a loophole for developers wide enough to drive a bulldozer through. Land that hasn't been farmed for years is still getting the big breaks, a situation it's up to the county assessor to correct. Examples documented here include a 133 acre vacant lot across from Mill Creek Elementary School and the Stan Kroenke estate on Nifong Road. Purchased by Mr. Kroenke for around $2 million dollars in 1998, and stubbed in with gas, power, sewer, water, a fire hydrant and cable lines, the land is worth only $40,000.00 today, according to assessor Schauwecker. As a result, Kroenke paid $275.04 in property taxes in 2007 and even less in previous years. Other examples include 18 acres of residentially-zoned land in the middle of Thornbrook owned by the Sapp family that produced a whopping $51.00 in property taxes last year; and the last undeveloped parcel at Broadway Bluffs. Listed For Sale as prime commercial land for $1.2 million but appraised by the assessor for $186,000, the commercially-zoned, in-development lot netted Boone County's roads, schools, libraries, and public safety $1,307.35 -- a $21,766.76 "developer discount" over what the land would have brought if it were assessed as the law says: at fair market value. The problem of so-called "undervalue favoritism" isn't unique to Boone County. The West Platte (Mo) School District has been fighting with Platte County assessor Lisa Pope over the huge discount she has granted the nearby Iatan Power Plant. At a September 2008 Board of Education meeting, board president Bill Taylor "called out" Pope for what he called "an arbitrary decision by the assessor to discount taxes on property at the Iatan power plant," the Platte County Citizen newspaper reported. 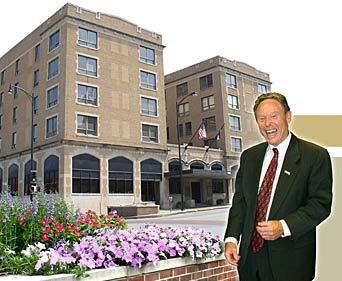 A precedent setting 2004 tax case saw Jasper County (Mo) assessor Don Davis fighting developer Northtown Village Properties all the way to the Missouri State Tax Commission. Northtown was trying to claim the farmland assessment rate for land in a residential subdivision. Jasper's deputy assessor Karen Wright "testified that she had physically inspected the subject subdivision on two occasions and had not detected any type of agricultural activity during her inspections," the case read. After several appeals, Northtown lost the case. FOLLOW UP: Mr. Schauwecker has steadfastly declined to meet with the Columbia City Council as a group, instead insisting on one-to-one meetings in his office. Council members, wanting a public hearing, have so far declined. This is what happens when you have a good ol' boy network. We need someone to step up and stop the hand shake and a wink deals that let this type of thing go on. Putting more financial burden on the middle class. 2011-2012, Heart Beat Publications. All rights reserved. Watermark theme. Powered by Blogger.